To create a friendly and stimulating atmosphere. To enable our students to develop and improve their English language skills. To increase personal confidence in their use of English. To offer courses of a high academic quality. To offer an extensive educational and cultural programme. To enable, encourage and respect our teaching staff’s continuous enhancement of their teaching and methodology skills. To provide a professional, reliable and honest working and learning environment for all. To provide a safe, relaxed working and learning environment to all. The school is situated in Dun Laoghaire (pronounced ‘Don Liri’) a charming seaside suburban town only 15 minutes by local train from Dublin city centre. There are plenty of small local shops, cafes and pubs where you can sit and enjoy the sea views at all times. Also, Dun Laoghaire is one of the only Dublin suburbs to include both a cinema and a theatre as part of its many attractions. The town also boasts Ireland’s largest, state of the art – and brand new – public library, situated in an adventurous new building with an innovative design. Here, students can use the facilities to study, use free Wi-Fi and read daily papers and magazines just two minutes from the school. 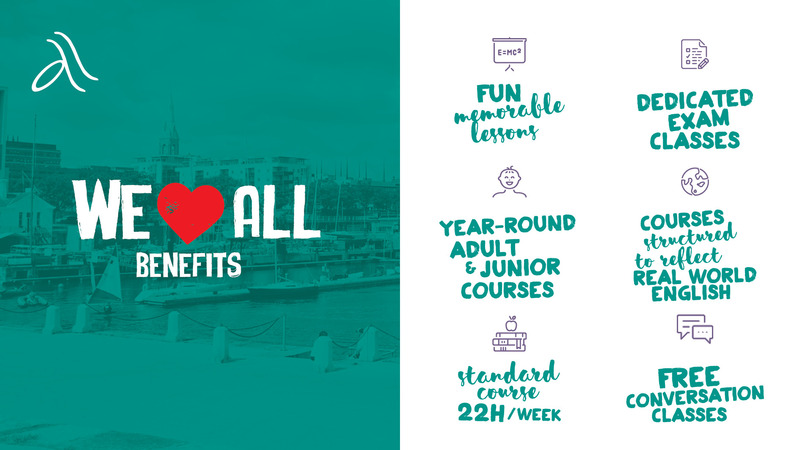 Staying in Dun Laoghaire, you have all the benefits of a small town with Dublin very close by. Trains go to the city every 10-15 minutes. In Dublin city, students can enjoy the wealth of museums and shops of a capital city as well as the, now proven, world famous Irish hospitality. Our host families are all experienced and very welcoming and all live within the local area and in many cases students can walk to school. Active Language Learning is a family run business with 30 years’ experience in the EFL market. Kay Mahon started the business in 1989 and is joined by her son Kieron and both strongly believe that their wealth of experience as a language school and their attention to detail allows them to help every student achieve their potential. 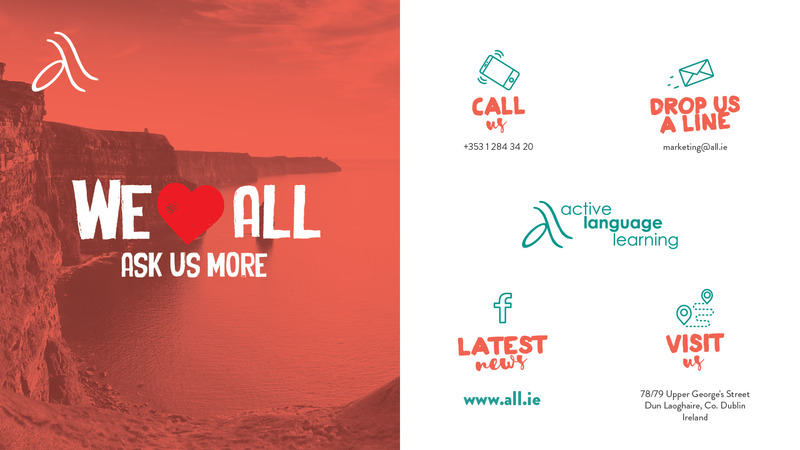 ALL is a founding member of Marketing English in Ireland, MEI, and is recognised by ACELS, a service of Quality and Qualifications Ireland, for English language teaching. Our school is purpose built and is situated in the centre of Dun Laoghaire in two large, period houses which have been extended. Inside, the school is modern and well equipped. We have 15 classrooms, a computer room, a library, a study area and free wifi available throughout the building. Our large student lounge offers tea, coffee and snacks. It opens onto a rooftop terrace where students can relax while looking out onto Dublin bay. Most importantly there is a welcoming reception where students can liaise with all school departments at all times. Our social activities coordinator always ensures that we have an exciting and varied calendar of events for students every week. 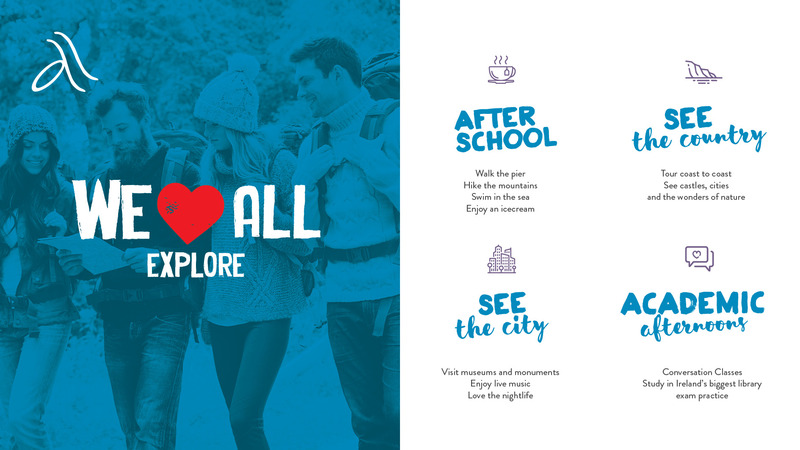 These include orientation tours to the city, movie afternoons, trips to local pubs and restaurants, weekend tours around Ireland and cultural days. Dublin is world famous for its culture and we ensure that every opportunity is offered to students to experience this exciting part of Irish life. Your progress during your course is our top priority, and we offer a number of extras to help you achieve the level of English you need. Our free conversation classes on Tuesdays and Thursdays help students to improve their speaking fluency and to meet and spend time with students in different classes. The more other students you meet, the more chances you will have to improve your English. Our academic manager is available twice a week to talk about your progress in class and to advise you on extra activities you can do to improve your English. For students about to undertake Cambridge and IELTS exams, we offer a practice exam correction service where you can get advice on your strong and weak points. Our experienced, qualified teachers come from the four corners of Ireland and have years of experience as language teachers. We here at ALL are proud of our long-standing reputation in Dublin for providing high-quality classes in a supportive, helpful environment. 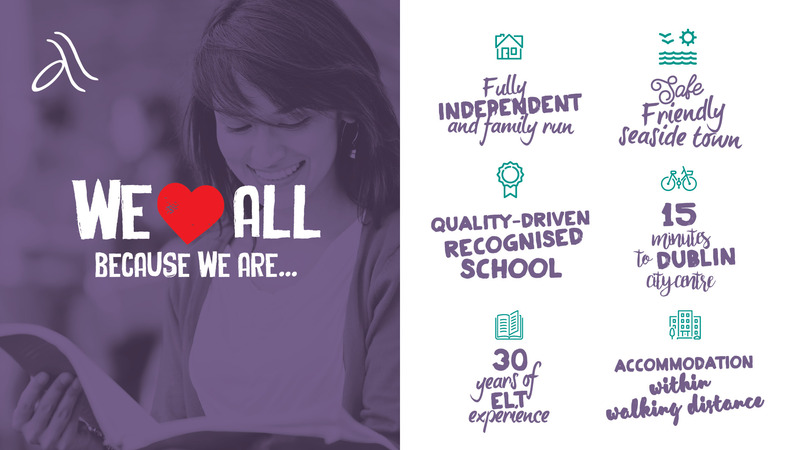 With almost 30 years’ experience as an English language school, we feel we have the skills and resources to provide students with a top quality experience.